We will enjoy shellfish and seaweeds to appreciate the richness of tidal flats. Please bring your rice balls and tea together with buckets, working gloves and caps. In case of rain, we will enjoy the slide picture show at the Community Center "Sugar Hall." For the photo gallery, we will have a slide picture show as the opening ceremony and mini live show on 17 April. Visit our web pages. Omine Beach is the last natural beach left within Naha City. 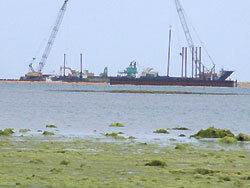 Tidal flats, seagrass beds and coral reef appear at low tides. We will learn coastal ecosystems and enjoy spring products such as seaweeds from sea. Bring your rice balls. Nature watching activity starts at 11:00, Hand-in-hand campaign and a meeting at 13:30, followed by a concert from 16:00. New findings reveal there can be a lot of new species of seagrass, algae and shellfish at Awase Tidal Flat Area. The Awase area also attracts a largest number of migratory birds in Okinawa. Let's stop the reclamation project at the area.